The cover image of Michal Chelbin’s “The Black Eye”, an empty gym with worn wooden floors and the bare bones of exercise equipment, aptly sets the stage for these sad portraits of young athletes from Russia and the Ukraine. 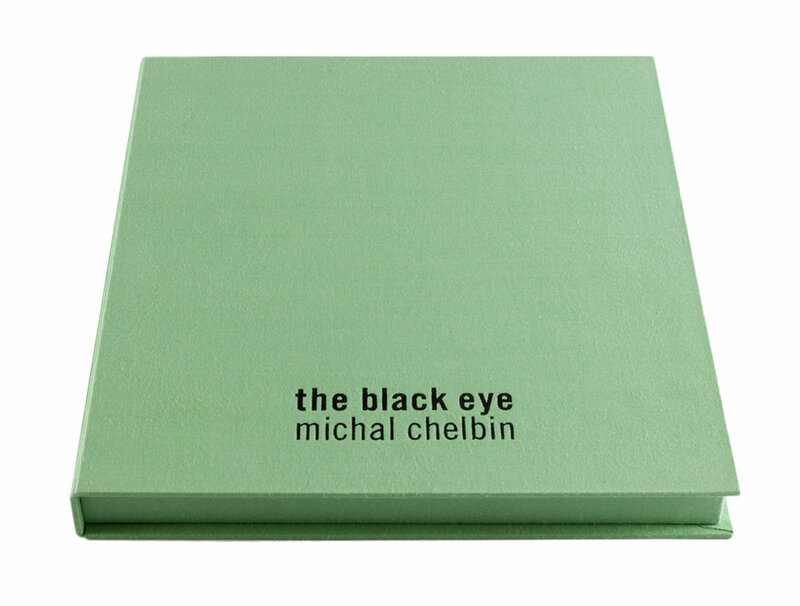 The 50 square- format photographs in this lush, oversized book are both terrific and terrifying. They are presented mostly one to a spread, either recto or verso, with many blank pages in between. Chelbin often uses the brightly painted, marred walls of the environment as background for single, double and triple portraits. The acid colors offset the bleakness and defeat shown in the eyes of almost everyone. On paired pages, the contrasting wall colors make the individual figures seem similar. The athletes pose in their boxing shorts or more-revealing wrestling uniforms, after a workout or a fight. They face the camera empty of emotion or suspicion: just pained, sweaty, and fairly hopeless (even if physically able to defend themselves). They look like prisoners. The single portraits are mainly set in the gym. The littlest boys are the most pathetic. A sad boy in blue, taking up half of a blue bench against a matching wall; a skinny little boy looking like he’d like to be a dancer, not a fighter. A child in red, black eye fading, the twisted strap of his uniform holding it onto his small body. These are touching and pitiful images. In Chelbin’s double portraits, a psychological triangle emerges. The partners seem bolstered by the presence of the other, gaining strength to face the camera. They are evenly matched, artfully posed. In a photo of a father and daughter, both of them look at the camera with equal seriousness. Her body is that of a child, but her face mirrors her father’s, as if they were twins. The photographs of three work as narrative. A coach’s two compliant underlings flank him - one pained, one dazed - submissively serving as armrests for his powerful presence. With his shaved head, mustache, hairy chest and cold stare, he seems to be the only one not coerced into posing. The last photograph in the book is of three tired wrestlers. One leans between metal parallel bars: he seems to have a sense of himself (or a defiance for the camera) that the two seated boys do not. They assume protective poses- one, barefoot with arms folded across his solar plexus; the other covering his crotch with his hands. In the foreground a punching bag looms like a dead fish. Chelbin’s eye is direct. Her subjects seem resigned to her inquisitions, trapped by the camera and their circumstances.